The oldest of three brothers, I was born in San Juan, Puerto Rico. From a young age, I was hypnotized by wildlife documentaries and classic TV shows broadcasted in Puerto Rico since the late 70s, like Marlin’s Wild Kingdom, Jacques Cousteau’s underwater stories, and Sir David Attenborough’s breathtaking documentaries. I believe these were responsible, in a large part, for my particular attraction to nature and wilderness. 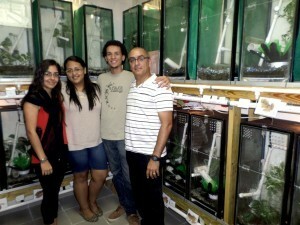 Dr. Neftalí Ríos-López (far right) along with several of his undergraduate students (from left to right: Rayza Hernández, Waleska Tirado, and Eliacim Agosto) at “Villa Coquí”, University of Puerto Rico–Humacao Campus. I got into college in 1987 to pursue a BSc in Science Education at the University of Puerto Rico – Río Piedras Campus (UPRRP). In 1992, under the supervision of Dr. Rafael L. Joglar, I had the opportunity to participate in several field research projects with Eleutherodactylus frogs. It was then that I realized that these were the sorts of activities that I would like as an occupation. Later, while working on my graduate studies/PhD at UPRRP, I met ecologist (and friend) Dr. Thomas Mitchell Aide who became highly influential for my development as a community ecologist. I completed my PhD in herpetofaunal community ecology under the supervision of a special man, Dr. John Paul Richard Thomas, distinguished herpetologist and my co-author in the description of Eleutherodactylus juanariveroi (Puerto Rican Coquí Llanero) in 2007. 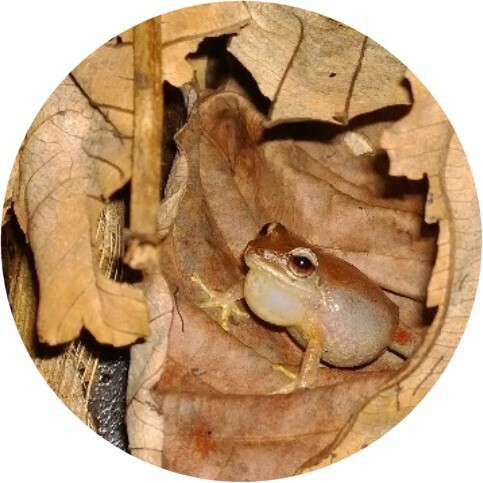 The Coquí Llanero is the most recent “coquí” frog discovered on the island (in Puerto Rico, we call all frogs of the genus Eleutherodactylus “coquí”). After graduation, I became a faculty member of the Wildlife Management BSc program at the University of Puerto Rico – Humacao Campus (UPRH) – an undergraduate institution. In 2012, state and federal agencies were about to list the Coquí Llanero as Endangered when I heard about an Amphibian Ark husbandry workshop in the Dominican Republic. I thought this workshop could benefit my goals of establishing a captive-breeding program for the coquí. I participated in the workshop (along with six of my undergraduate students at the time) and became aware of the organization’s vision and mission first hand. During the week-long workshop, I witnessed the extraordinary level of commitment by the staff and lecturers. It was not a convenient workshop, but it was one of the most influential professional activities in my recent career – thank you guys! Later, I applied and received an AArk Seed Grant that allowed me to start my ex situ conservation project by the end of 2013. Expectations were high, but emotions were even higher as I was finally about to engage in this unique initiative with the highland Puerto Rican Eleutherodactylus (E. portoricensis). In essence, AArk allowed the first project entirely conceptualized, developed, and conducted on the island, for a species in much need for conservation! I thank the Amphibian Ark and their sponsors that make these projects life-changing experiences with profound consequences for education and conservation. Based on what we learned during the AArk’s husbandry workshop, I designed and set up the breeding facility room, which undergraduate students later baptized “Villa Coquí” or Coqui Village, now an iconic place at UPRH. The project has represented a considerable challenge bearing an equally large responsibility for me, but ultimately for the benefit to the species and my students. In April 2014, we received a most anticipated reward: the first ever successful reproduction event occurred with an upland species of Puerto Rican Eleutherodactylus! We are now rearing juveniles of captive breed E. portoricensis. We are so proud of our project that we wanted to share our experiences with you – though at this stage, only in Spanish – at www.uprh.edu/labneftali. I also have a field component focused on studying the population ecology of the species in a locality where they still thrive in Puerto Rico. I continue exploring the central-western mountain range in hope for remnant populations within the species, to find adequate sites for introducing captive-breed individuals that can generate self-sustained populations, and also look for other species that have not been detected in decades. I have used this whole project as a fundamental educational tool for motivating my undergraduate students into amphibian conservation and wildlife management at UPRH. My future plans include expanding our ex situ project, developing a husbandry and reproduction protocol for similar Eleutherodactylus species, seeking extra laboratory space for nurseries, and starting a long-time dream of a Coquí Llanero captive breeding program at UPRH. In addition, I foresee local husbandry workshops given in Puerto Rico by trained individuals that were equally influenced by AArk’s capacity-building initiatives – the true legacy of AArk’s efforts worldwide. Likewise, I look forward to a Puerto Rican “Amphibiary”: one oriented at education, public awareness, professional development, and amphibian conservation and research in Puerto Rico. I am convinced such an Amphibiary can be a reality soon. The work required by these kinds of projects is enormous and full of sacrifices. These projects require a lot of commitment and patience for success, which can only be achieved by the work of my best collaborators at this time: my undergraduate students at UPRH. For some of them, this project has represented a unique research and educational experience. For others, I have witnessed life changing experiences that will multiply, for sure, our next generation of amphibian conservationists and wildlife managers for the benefit of those remarkable animals we call “coquíes”. In Puerto Rico, I believe the seed has now germinated for good. For that, I thank the Amphibian Ark and their sponsors that make these projects life-changing experiences with profound consequences for education and conservation.